‘Tis the season for optimism. Much like the 30 MLB clubs, we fantasy baseballers are an unashamedly forward-looking crew this time of year, our championship hopes pinned on player rebounds, injury-free campaigns, rookie success and all of our favorite young player breakout choices coming true. It’s draft season, and before the ink is dry on our pen-and-paper rosters, we’re all self-congratulating ourselves that our projection systems have rated our post-draft teams the best in our leagues. As if there should be any other option. Get the 2019 season started off on the right foot! Access articles like these and our diverse range of tools with a subscription to BaseballHQ.com. Winning. Fantasy Baseball. Insight. And hey, I’m as guilty as anyone. I freely admit I like many elements of my 2019 Mixed Auction team that I drafted this past weekend at the Tout Wars festivities in New York City. Though I wasn't thrilled with my start, and had some moments of self-doubt partway through—when I feared I had misread the room and my team construction would suffer—by the end I was comfortable with my squad. Ready to compete, even—which is prudent, given the start of the season is just days away. Some of the wacky prices reflected the crazy auction dynamics this year. Speaking with some leaguemates afterwards, they agreed that pricing, especially for the top tier of players, seems to get more out of hand every season (like many leagues, most of the group has been together for a while). It felt like most owners just spent bonkers on the high-end players, which has ramifications later in the auction. And, of course, the order in which players came up for bid, and each individual team’s own budget and many other factors also play a large role. The entire grid is here (go to the "Mixed Auction" tab), and it will take just one glance to see what I mean as far as highly-priced superstars. But back to the analysis, and optimism. Instead of either going through the team in purchase order, or by position order, or by some valuation order, and point out why I like each pick, or chose the player, I’m going to play the downside game. We know all of these players aren’t going to work out, will need to be reinforced by others in the free-agent pool or via trade. So let’s shift to the "downside" (or, some might call it, "realism") for some selected players, just for kicks. It might help reveal some initial pockets to look for reinforcements early on in the season. Or, might be just the comfort I need if, say in mid-August, it has all come crashing down ("I shoulda known"). In any event, let's call this my list of “what could go wrong." Let’s embrace risk and realism. Yasmani Grandal (C, MIL); $22: A lot to invest in a catcher, and that 2017 is recent enough to be concerning. Yes, he walks a ton, but it’s not exactly like he’s an OBP anchor—he has been over .350 OBP just once in five years. The difference between him and J.T. Realmuto is much greater than the $3 in auction price, when thinking about how I used my resources. Jonathan Villar (2B/SS, BAL); $19: The risk here is recency bias, baked into that 2018 second half tear he went on after the trade to Baltimore (8 HR/21 SB). With a new manager, we don’t know for sure just how much of a green light Villar will have, and let's be honest, we’re buying him for the SB here (though the early returns are good: three SB in three attempts in 30 AB). But poor contact, both in quantity (~70% ct%) and quality (80 HctX in 2018) could make this one go south quickly. Asdrubal Cabrera (2B/SS/3B, TEX); $6: It’s not a huge bid number, and he’s a leading member of 2019 Team Boring. But he’s 33, his contact rate took a pretty big dip in 2018, and there’s some pretty serious OBP downside. Plus it’s a middling-power-only profile and there’s enough uncertainty in Texas to wonder if he’ll keep a full-time job all season. I had some roster construction success with multi-position eligibility types last year, so I could have put too much emphasis on his flexibility in this point. 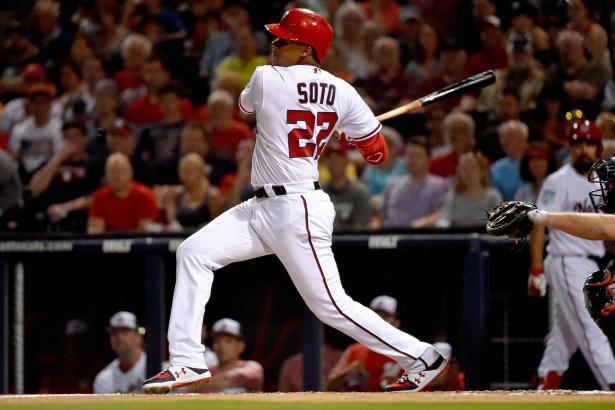 Juan Soto (OF, WAS); $36: It’s a lot to ask of a second-year-player to be such a cornerstone—Carlos Correa, Cody Bellinger and Trevor Story are just some of the players who flew through Year 1 (with skills support) only to tumble hard in Year 2. If that happens—for any one of a number of reasons—my offense takes a hit, especially as he’s my lone ~.400 OBP guy. And I’ll be regretting that 14% of my auction dollars that I could have spent on a more proven profile. David Dahl (OF, COL); $16: Perhaps one of my biggest risks, given his 471 career MLB AB have been spread out over three seasons. A more justifiable “F” Health grade is rarely given, and his career 0.27 Eye points to a questionable plate approach. Production has been good, but it's going to be all about staying on the field. Avisail Garcia (OF, TAM); $3 and Tyler O'Neill (OF, STL); $1: Both of these players have not secured fulltime jobs yet and are on teams that have been known to mix-and-match their way to contention. In a mixed league like this, the path is short to the "hurts you" category for non-fulltime players. In addition, Garcia is more of a “no plus tools” type (career xPX of 83), and O’Neill’s rookie debut was a full-on metrics mess (56% ct%; .215 xBA over 130 AB). Paired with Soto and Dahl above, I'm realizing there’s some massive OF downside on this team. Corey Kluber (RHP, CLE); $33: Small fissures in Dom, SwK and Velo from 2017 could easily widen here in his Age-33 season. Anything less than 200 IP and 200 K would be a disappointment given his price. Plus, the Indians’ offense surely has taken a step back from last year, and that could cost him some wins. Robbie Ray (RHP, ARI); $9: His yearly Ctl trend since his debut in 2014 is quite disturbing: 3.5 / 3.5 / 3.7 / 3.9 — finishing with a whopping 5.1 in 2018. At the same time, his penchant for giving up home runs has only gotten worse from 2016 to 2018—hr/f of 15%/16%/17%. That is a potentially disastrous combination. Jose Alvarado (LHP, TAM); $8: Only one year at this level; huge FpK drop in 2018 (from 65% to 55%) indicates that his 4.1 Ctl in 2018 was earned and that baserunners can be plentiful. Also, his handedness and the Rays’ outside-the-box pitcher usage patterns point to a team who will likely move players from role to role without blinking and ding his saves totals. There are, of course, many more risk factors on this roster that I didn’t mention. Thankfully, most of my competitors have their own; that’s why we play the season out. Now that I've fully embraced reality, I still do like my team; most of the infield have been proven performers and there are both high-powered (Gray, Reyes, Bundy) and high-skilled (Bieber, Strop, Giles) arms on my staff. What do you think? Leave questions, thoughts and concerns in the comments section below.